Colombia's ex-president (2002-2010) Álvaro Uribe Vélez has been described as the worst ex-president ever, because he is continuously criticizing his successor President Juan Manuel Santos and the FARC-peace-process by Twitter, Facebook, his website, his Youtube channel and by means of numerous interviews and lectures - in Colombia and abroad - about his political views and his book. His Twitter account has 2.5 million followers as per November 2013, grew 1 million followers the last 12 months and this number is still growing. In October 2012 he admitted in an interview with Jorge Ramos that he is not writing his 20 tweets/day himself, so a PR-assistant is probably taking care of this. Uribe can't be president again, so what is his mission and goal? It's obvious that Álvaro Uribe spends a lot of money on political PR activities. There is a PR-team behind him that is writing his tweets, his lectures and speeches and maintaining his websites. He is traveling a lot to give lectures, interviews and speeches to spread his political views and to talk about his published memoires (2012) No Hay Causa Perdida, which was written by a ghost writer and published as No Lost Cases in English too on the same day to better promote Uribe's message in the US.. In July 2012 he even founded a new political party Centro Democrático. One questions who is paying all the bills. It is more then obvious that Uribe's Political PR activities are sponsored by the Colombian oligarchy, because they benefit the political PR message that Uribe is spreading, the most. The message that Uribe is continuously spreading and also to be seen in the video below boils down to: "During my presidential terms Colombia was dramatically transformed from a failed state into a far more peaceful, stable modern democracy with a promising future. The FARC troops were diminished from approx. 30,000 in 2002 to 6,800 in 2010. President Juan Manuel Santos should have finished the job, but he didn't. If the peace process succeeds, it will bring more impunity, which I am against; it may also bring a Chávez/Castro model for Colombia, which I am against too." You can read further on in this blogpost that these particular views of Uribe are unreal and not based on facts. It sounds like political PR talk. Álvaro Uribe claims that during his 2 presidential terms, Colombia became a more peaceful state. Uribe who had been a critic of Pastrana's peace process with the FARC 1999-2002 already, chose to fight the FARC-EP more intensely and that had its violent consequences during his presidential terms. The statistics on www.verdadabierta.co show that IDPs/year remained at a historically high level and only started to decrease seriously during Santos' term. According to the CODHES human rights NGO, forced displacement during Uribe's term affected over 2.4 million Colombian nationals by the end of 2009. President Uribe ordered the Orion Operation against the Comuna 13 in Medellín, in October 2002. The government used Black Hawk artillery helicopters that machine-gunned the inhabitants of the hills of Medellín. 1.500 people died. Don Berna, from his prison in the United States, confessed that a lot of the corpses were secretly transported in army trucks to La Pintada, where they were thrown into the Cauca River. By virtually granting amnesty to 95% of disarmed paramilitaries, he enabled these fighters to continue and extend their violent and criminal practices as BACRIMs. Uribe forgets to mention that much conflict related violence to civilians was (during his terms) and still is committed by the state (e.g. Army cooperating with paramilitaries, DAS-Intelligence, Police). For instance Uribe doesn't want to be remembered to the "falsos positivos" case that was orchestrated during his term and where more than 3,350 innocent young civilians were murdered by the state to be dressed up and counted as killed FARC-guerrillas. Álvaro Uribe claims that Colombia became a more stable democracy during his 2 terms. He forgets to mention the Parapolítica scandal during his term, the accusation and investigation of Uribe for political bribery and the wiretapping scandal. Not to mention that Uribe's 2002 presidential campaign was financed by paramilitaries, while the 2006 congressional elections were rigged by paramilitaries. Álvaro Uribe says that the 2012 peace negotiations with the FARC, will lead to more impunity. That's still to be seen. FARC negotiator Catatumbo has already said he doesn't mind to go to prison for a few years if that serves a durable peace in Colombia. Anyway, it was Uribe who virtually granted amnesty to 95% of AUC paramilitaries during his 2 presidential terms and paramilitaries in Colombia are known for committing the most atrocities and violence. adjusting his glasses has even become his logo. Álvaro Uribe thinks that president Santos should have exterminated the approx. remaining 6,800 FARC-rebels and he's continuously criticizing Santos for negotiating peace. Well, Santos knows that a guerrilla war can never be won militairily, even if you kill all FARC-rebels. A guerrilla war can only be stopped by negotiating and taking away the underlying resentment, which is the large inequality in Colombia's society. Santos hopes to decrease the number of FARC-rebels to zero in a much more durable way; by making peace. But what Alvaro Uribe isn't telling is that he sought secret talks himself during his second term with the FARC in Switzerland, and the guerrillas even reached out to the U.S. Embassy, according to Wikileaks U.S. diplomatic cables. Uribe's fear for a Castro/Chávez model in Colombia after the FARC has returned to the political arena doesn't make any sense at all. Colombia isn't Venezuela nor Cuba. It just looks like Uribe prefers a continuation of the conflict above durable peace in Colombia. Before Álvaro Uribe became Colombia's president in 2002, Uribe already had quite a notorious past. In 1994 Álvaro Uribe, then governor of Antioquia, was one of the primary proponents of the CONVIVIR program that resulted in more or less 50,000 paramilitaries. In 1997 Álvaro Uribe, still the governor of Antioquia, turned out to be the intellectual author of the El Aro massacre. Former president Álvaro Uribe was once on the Pentagons narco-terrorists list himself and both Uribe and his father were collaborators of the Medellín Cartel and friends of Pablo Escobar Gaviria. A US Defense Intelligence Agency report that was declassified on a FOIA request, profiles "the more important narco-terrorists" in 1991, mentions this on Page 10/11. The Uribe family ranch La Carolina, located in the Cuivá savannas, 15 kilometers from the town Yarumal, was identified by human rights bodies as an epicenter of paramilitary violence. It is quite obvious that a man with a notorious past as Álvaro Uribe must have known about the "falsos positivos" policy during his presidential terms and it is not unthinkable that he will be tried by the ICC for his part in this. The International Federation for Human Rights (FIDH) produced a report on this matter in May 2012, alleging over 3,000 civilian victims between 2002 and 2008. The group asked the Prosecutor of the International Criminal Court to open an investigation, which is on going. Lately demonstrations are organized at places where Álvaro Uribe is giving lectures or speeches. Young latinos and students, recruited by means of social media, are chanting Asesino! This happened for instance in London October 2013 and Popayán August 2013. The above is just a selection. If you want to know more about Uribe's notorious past, read Olga Behar's 2011 book "El Clan de los Doce Apostoles" (The clan of the twelve apostles). Olga Behar is a wellknown investigative Colombian journalist, who fled Colombia 20 years ago because of threats. She is now living in Mexico. Colombia's constitution prohibits that Uribe can run for president for a 3rd time. That's why he founded the new political party Centro Democrático. Uribe's aim is to stop or delay the peace process in Havana by means of manipulating public opinion. If there is no peace agreement before 25 May 2014 (presidential elections day), Santos may not win the elections. Also it will be uncertain if the peace process is able to continue. Zuluaga already made some strong statements. If the peace process is aborted before the 2014 elections, Santos will have a hard time to win the elections too. By means of his Twitter account and the Colombian media, who happily take over all of his tweets, Uribe is trying hard to slander the FARC and president Santos. 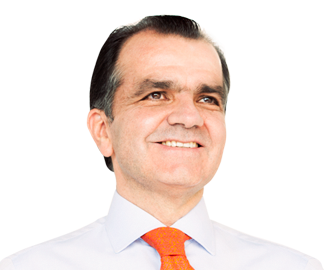 Centro Democrático's Óscar Iván Zuluaga announced his presidential candidacy October 26th. Zuluaga is a 100% Uribisto. Zuluaga will even use Uribe's picture on the ballot. Santos' popularity in 2013 increased to 36.9 percent in November from 29 percent in an October Gallup poll (25 percent in August). Gallup spoke to 1,200 people in more than 50 cities and towns across Colombia. The survey had a margin of error of 3 percentage points. Zuluaga's popularity reached 25.6 percent in the November poll, up from 17 percent in October. Also the Gallup survey showed that Santos would win 27 percent of the vote if a first-round presidential election scheduled for May took place now. The poll said Santos would take 39.4 percent in a second ballot and win the presidency. But it is still 6 months to go. Uribe also announced on 16 September 2013 that he will run for a senate seat in 2014 parliamentary elections on March 9, under the banner of Centro Democrático. Centro Democrático is set to win at least 10 senate seats, according to most estimates. Some analysts even talk about 30 senate seats, which would give the party significant control of the legislative agenda. 30 senate seats for Centro Democrático could become a serious hurdle to implement and ratify the peace agreements. Uribe faces several legal accusations, which might dissuade him from taking a senate seat and giving up his immunity from prosecution, as a former president of the country. Uribe has been repeatedly accused of assisting right wing death squads during his stint as Antionquia’s governor in the 1990s and during his two-term presidency 2002-2010. Under Colombia’s constitution, presidents enjoy a special kind of judicial immunity. Presidents can only be investigated by a special Congressional commission made up of 15 representatives. Unlike congressmen, they can’t be investigated by the Supreme Court and other judicial bodies. As a senator, Uribe would be open to investigation from other judicial bodies, according to some legal interpretations. He could then be charged by the Supreme Court, the judicial body that has most actively pursued the parapolítica. If Uribe is elected, he could only be accused by the Supreme Court and other judicial bodies for what he did as the governor of Antioquia, but not for what he did as president according to Jaime Córdoba Triviño and Francisco José Sintura. If Uribe, when elected as senator, chooses not to become one after the parliamentary elections 2014, then the reason will be obvious. Alvaro Uribe = AUC ,drug dealer,killer, the world hates Alvaro Uribe and he brainwashed many Colombians into his demented ways of thinking..